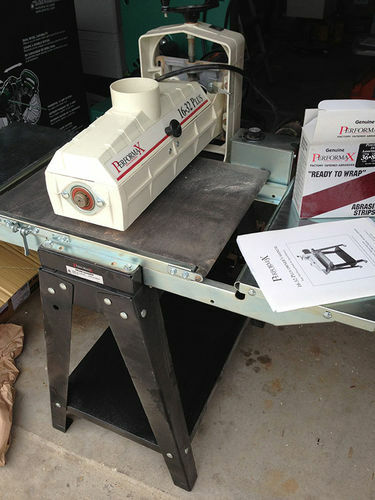 So, I agree with him to come Saturday morning (day of my birthday) and take a look at the sander (aka buy it). I picked up my cousin and we made our way over there to pick it up. The sander comes with a box of unused sanding rolls (don’t know the cost, he estimated roughly $40) and the extension tables, which, from my understanding, were a $100 accessory when purchased new. I inspect the sander, seems to be in great condition, the drum, as he points out, is in great shape. There is some exterior paint on the back of the drum housing because he had a spray booth set up in his shop next to the sander’s location but I could care less about it really. I turn it on, runs pretty smoothly. I run a board through it, seems to sand just fine. 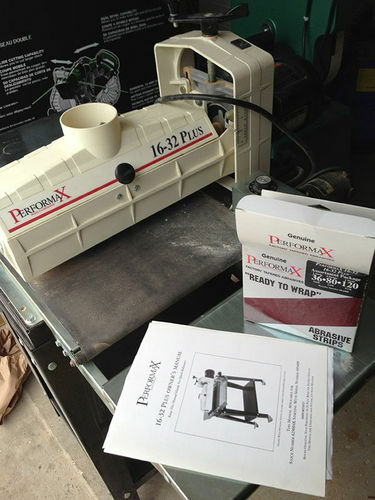 I’m no expert at inspecting machines and this is my first drum sander so I have no idea what to look for but it seems to me that all things check out great (matter of fact, I could use a bit of advice on how to really “test” this puppy to make sure my panels/whatever else will be coming out nicely out of it and where to buy some more rolls of paper in different grits would also be welcome). Anyway, what was the final price of this sander, you may be asking yourself at this point? A whopping $150 :) HAPPY BIRTHDAY TO ME!!! Wow! You got a deal. DITTO… WHAT A DEAL !!! Nice, Matt! Great deal…and you’ll love it. For this CL SCORE, you have earned an official LJs…..
Great score!!! I’m sure you will enjoy using it. The one “check” that I can think of, is to measure the final thickness of each side (left edge vs. right edge) of a sanded board. You want to verify that the “arm/drum” is parallel to the table and not flexing when sanding. You sir are a very lucky man. Did you go and buy a lottery ticket or did you figure you’d used up all your luck? Thanks guys! I was giddy when I saw the post on CL thinking it was too good to be true. @DIYaholic: good point, I’ll definitely do that. @CL810: haha, I figured it was all out by then plus a little bit of birthday spirit. I wish I could have found mine at the price. Would you be willing to post close-up pictures of how the extension tables attach? I would love to add a home-made set to mine. Nice haul. I use my Performax 16-32 all of the time! @JesseTutt: absolutely, next time I’m in the “shop” I’ll snap some pics for you. I paid $125 for mine, but it needed work, and didn’t have a stand or extension tables. It vibrated quite a bit, which may be why the price was so low. When I checked it out, I found quite a lot of dust build up inside the drum, which is open at the ends. This buildup was concentrated at one side, which threw it out of balance. Grizzly has the sanding belts. I have used Jet belts, which are already cut to fit. (They bought out Performax, which is now branded as a Jet). Grizzxly also has a hook & loop conversion kit, which I have purchased, but not installed yet. that’s a really excellent deal. my ryobi 16/32 was $225 and i thought that was a good deal. $150 is almost like stealing it. good luck with it. 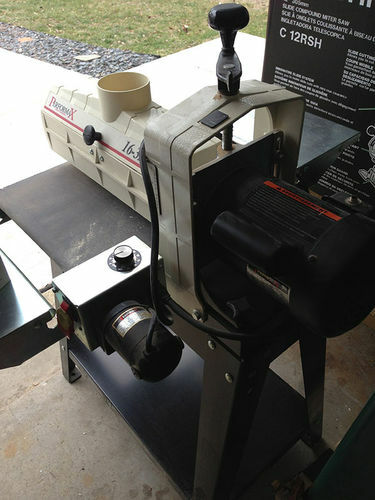 I bought the Jet version of that same sander brand new a few months ago and it was $900 without the extensions. So yeah, you got a good deal.